Featuring 4x 10W 4-IN1 Quad LEDs (RGBW - Red, Green, Blue and White), the Inno Pocket Wash will give pure lighting excitement with its fast moving head and brilliant washes of color. It has a pan and tilt inversion mode that makes one head do the opposite of another when linked together. Users may control the Inno Pocket Wash by Sound activation with its 4 built-in shows, the optional UC IR wireless remote, or use a DMX controller to create your own light shows. The ADJ Crazy 8 Moving Head creates exciting lighting effects with its quick sweeping beams and 8-Zone chasing, pulsing and strobing LEDs. This unique fixture features two independently tilting bars (each with 4 lenses) that project tight, 4.5 degree beams of light from 8-Watt white LEDs. 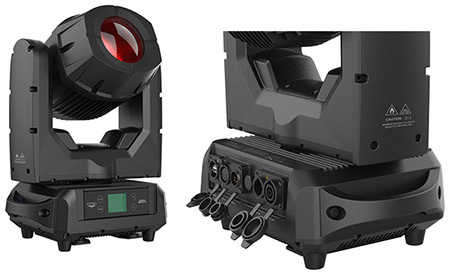 The Crazy 8 offers 5 DMX Channel modes and a 4-Button LED DMX menu. It may be controlled via it’s own built-in programs, a DMX Controller or the easy-to-use UC3 Controller. 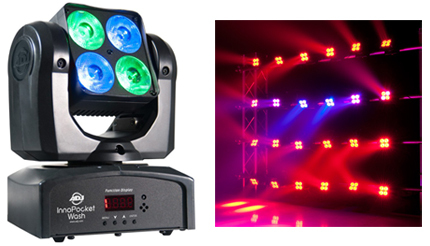 Best when used in multiples, the Crazy 8 is designed for stages, nightclubs and mobile entertainers. 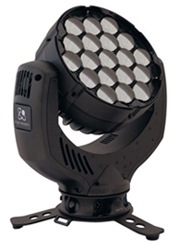 This unit slides into a 6 1/4" gel slot and turns an ellisoidal into an intelligent fixture! Control pan and tilt with 16 bit precision from a DMX console. The I-Cue uses the same power supply units as Rosco Gobo Rotators. 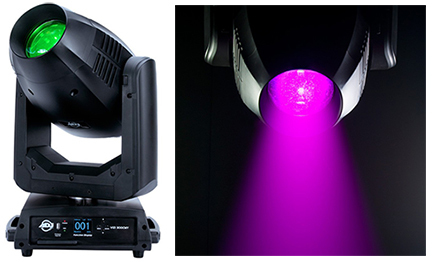 The impression X4 features 19 RGBW high output LED's. In its slimline body, with no base unit, the impression X4 houses a 7 to 50 degree zoom range, full color mixing including CTC and customizable pixel patterns across its front face. Meet the Flurry Beam™, the fixture with a super-sharp (watch your fingers) 2.5° beam angle and outstanding RGBW color mixing. It’s fast, it’s ferocious, and it also offers precise 540°/220° pan and tilt movement with 8/16-bit resolution.